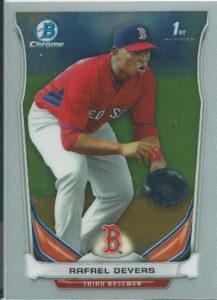 Collectors first found Devers in 2014 Bowman Chrome Draft as part of the Top Prospects subset. This card was available in both a paper base and the much more desirable Chrome version. Along with each of those versions, as typical with most Bowman releases, the card was available in a number of various parallels. 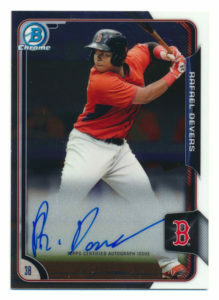 While collectors had to wait for Devers to have his first Bowman Chrome Auto, the wait was rather short as he showed up in 2015 Bowman baseball. A set that had numerous quality control issues, you can expect to find BGS 9.5 and PSA 10 copies to command a premium. 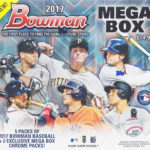 These Bowman Chrome Autos are available in the typical rainbow of parallel colors. 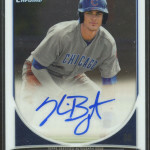 The Elite Extra Edition Prospect Auto offers collectors a much cheaper alternative to the Bowman Chrome counterpart. 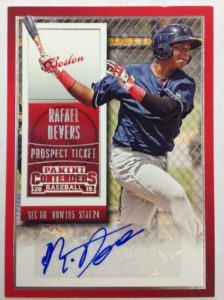 Unlike the Bowman Chrome Auto, this card features a sticker autograph which really takes away from the overall appeal of the card. 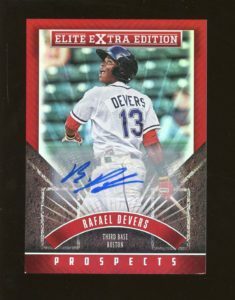 While Elite Extra Edition is the flagship product from Panini for prospectors, the set has fallen off over the past few years. Similar to the Bowman version, this card also features a number of Status version parallels. 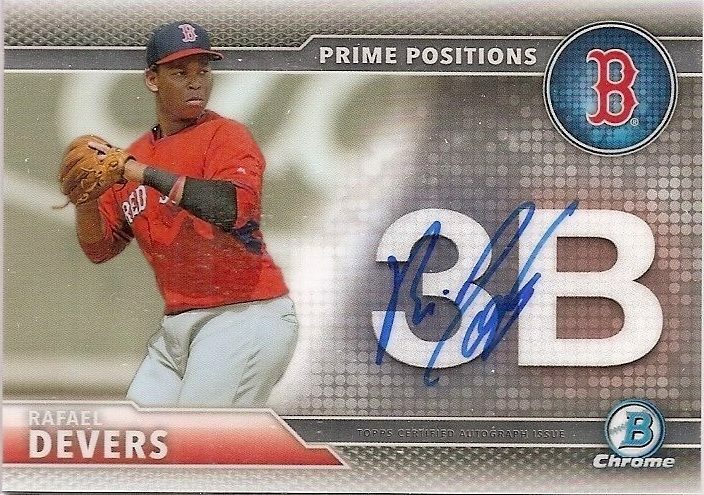 The most affordable of all of Devers 2015 issued autos is his 2015 Panini Contenders Prospect Ticket Auto. Like the Elite Extra Edition version, this card features a sticker auto and has a number of parallels.